Annie Hall and Manhattan are two seminal films from a master filmmaker made nearly one after another (with Interiors sandwiched in between), both nominated for Oscars. Although, Annie Hall was the bigger winner for Best Picture and Best Director (Manhattan received Best Original Screenplay and Best Supporting Actress noms). Having the opportunity to watch both films again on Blu-ray back-to-back, they make an interesting comparison. Manhattan or Annie Hall? Which film is better? Which do you prefer? It's an often discussed point of debate among Allen fans and filmgoers in general. Full disclosure though – I don’t consider myself a Woody Allen fan. Although I admire his prolific ability to write original material and be successful, I also think he has suffered from making too many films and choosing quantity over quality. But Annie Hall and Manhattan are both magnificent studies of human relationships, exemplary to Woody Allen's innate filmmaking skills. 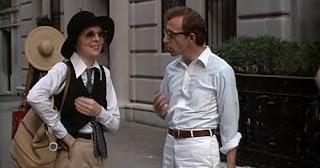 In Annie Hall, Allen charts the ups and downs of the relationship between Alvy Singer, a stand-up comic living in Manhattan (the thinnest veil of himself he’s ever written), and an effervescent up-and-coming singer, Annie Hall (Diane Keaton). In Manhattan, Allen leads the four-person ensemble of characters/friends and the complexities of their relationships. After his second divorce with his ex (Meryl Streep), Isaac Davis (Allen) finds himself in a relationship with a 17-year-old (Mariel Hemingway). His best friend, Yale (Michael Murphy), though married, has an affair with the slightly psychologically damaged Mary (Diane Keaton), who eventually falls for Isaac, thus disrupting his friendship with Yale. Stylistically, the two films couldn’t be more dissimilar. In Annie Hall Allen applies a distinctly flashy and unconventional narrative technique, including quick flash cuts to Alvy’s inner thoughts. The most memorable, perhaps, is the quick insert shot of Alvy as an orthodox rabbi eating dinner with Annie’s waspy parents. The entire film is filled with these clever editorial innovations, including talking directly to camera, subtitles expressing the characters’ unspoken subtext and split-screen conversations. Manhattan is classical in style, subdued and mature, visualized under a slick anamorphic black and white visual palette. If anything, it resembles something Francois Truffaut or Billy Wilder might have shot in the ‘60s. 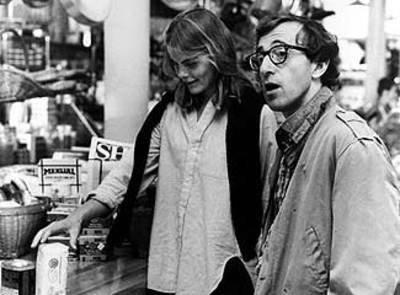 Allen also lets his other actors command the screen, whereas Annie Hall could be seen as a narrative expression of his stand-up act, like Seinfeld. There’s a distinct naturalism to the narrative in Manhattan, but it doesn’t sacrifice its dreamy-romantic, optimistic and cinematic finale. Annie Hall’s trajectory is mostly downward, an anti-romance with Allen himself left holding our sympathy. Allen takes his character to task in Manhattan, at first unceremoniously dumping Mariel Hemingway’s character so he can get with Diane Keaton. This causes his need for repentance and reconciliation in the rom-com-worthy finale scene. In Annie Hall, Allen always seems to be the victim to the chase of Annie's enigmatic personality. Interestingly, both films were shot by the great Gordon Willis (the Prince of Darkness! ), famous for shooting The Godfather films. But here he shows remarkable range in accommodating the two different tones of these two films. Annie Hall, shot with natural light, is also quick and mobile. Manhattan’s stark black and white, combined with the delicious Gershwin music, evokes a romantic and more classically cinematic tone. Both films are terrific, funny and moving, as well as profound examinations of adult relationships. Whichever film one prefers, the resonance of both is enhanced by the differences from the other, demonstrating Allen’s great ability to experiment and innovate within his beloved medium. Annie Hall and Manhattan are available from MGM Home Entertainment. Woody Allen, his films sure are innovative. Interesting, about this Annie Hall VS Manhattan deal.